Plique a Jour with Carmen Lombardi and a Torch! The plique-à-jour technique with torch, amazing! 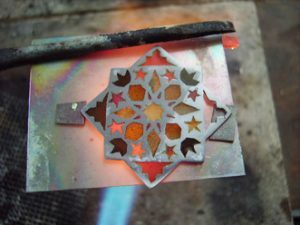 In my research of alternative methods used in Plique a Jour I can across this article in Glass on Metal, by Carmen Lombardi and yes she uses a torch to create Pliique a Jour. 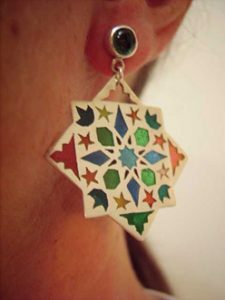 Carmon uses sterling silver as her metal to pierce out her plique design, and titanium to support her enamels, remember..enamels do not stick to titanium. Make a pair of earrings by using 950 alloy and a 0.90 mm thick metal sheet. 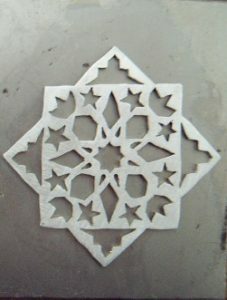 Cut out the design internally, so as to make the carved areas have the maximum length of 5.00 mm and be at least 3.00 mm distant from the borders, and by keeping between them a minimum distance of 1.50 mm. 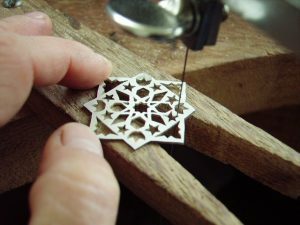 Those measurements are necessary in order to guarantee a steady frame for the silver and to prevent the enamel from damaging. 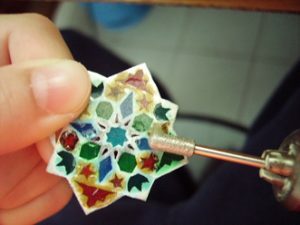 Put the pieces on a titanium sheet and apply wet enamel in light colors using a number 0 (zero) brush (the silver piece and the titanium sheet must be very plain and they must be one even with the other). Dry off the enamel very well during the application to keep it from becoming soaked and from running down the piece. The titanium is used in this technique because the enamel doesn’t adhere to its surface. Handle the titanium sheet by picking it up with the third hand tweezers and by being careful not to move the piece from its place. Heat up the titanium underneath by using the torch, first with the candle flame (closing partially the air flow valve) and after with the hard flame, since it is necessary much heat for the enamel to melt. Let it cool down and repeat the enamel application and the burning procedures as many times as it is necessary for the enamel to reach the thickness of the silver metal sheet. Make the finish on both sides with the diamond point by cleaning up very well the part that was in contact with the titanium and after that sand them by using all the sandpapers up to 600. 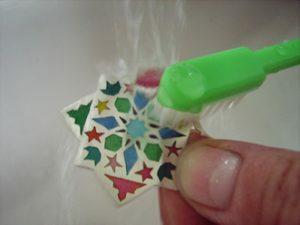 Wash the pieces in running water by utilizing a toothbrush with smooth bristles. 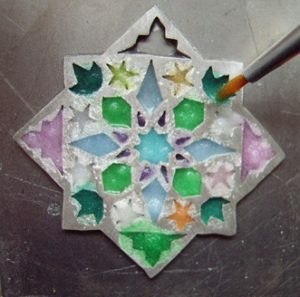 Melt the pieces again in order to make them gleam. 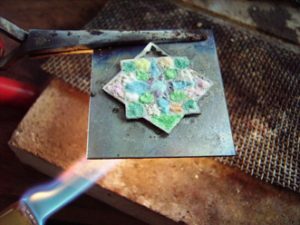 For that you should rest the pieces on small metal sheets of titanium and be careful not to let the latter touch the enameled areas. Let them cool down. 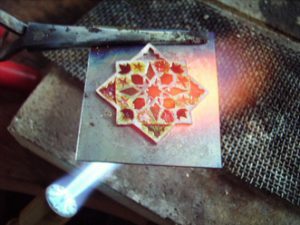 Then, place them into the acid to make the silver get brighter, and finally polish them up. 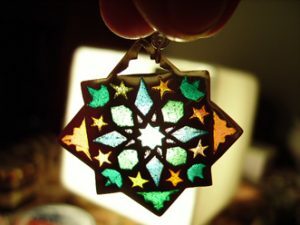 The ‘plique-à-jour’ technique is perfect for making earrings, making a bigger enamel transparency effect possible. Thank you Carmen for sharing!